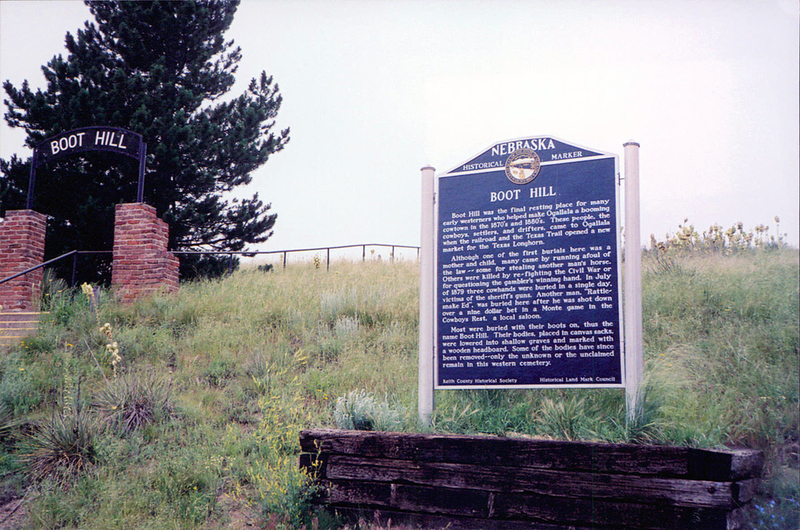 Boot Hill was the final resting place for many early westerners who helped make Ogallala a booming cowtown in the 1870's and 1880's. These people, the cowboys, settlers, and drifters, came to Ogallala when the railroad and the Texas Trail opened a new market for the Texas Longhorn. Although one of the first burials here was mother and child, many came by running afoul of the law -- some for stealing another man's horse. Others were killed by re-fighting the Civil War or for questioning the gambler's winning hand. In July of 1879 three cowhands were buried in a single day, victims of the sheriff's guns. Another man, "Rattlesnake Ed", was buried here after he was shot down over a nine dollar bet in a Monte game in the Cowboys Rest, a local saloon. Most were buried with their boots on, thus the name Boot Hill. Their bodies, placed in canvas sacks, were lowered into shallow graves and marked with a wooden headboard. Some of the bodies have since been removed, only the unknown or the unclaimed remain in this western cemetery. “Boot Hill,” Explore Nebraska History, accessed April 18, 2019, https://mynehistory.com/items/show/304.